It's Tuesday and time for another sewing circle meeting. Remember that I had some yarn left after finishing the granny square baby blanket? I used the leftover Hillesvåg Superwash (a Norwegian 4-ply machine washable 100 % worsted wool) to make a Baby Surprise Jacket. The pattern is by Elisabeth Zimmermann, and it is pure genius! The jacket is made in one piece, with simply two seams at the sleeves. 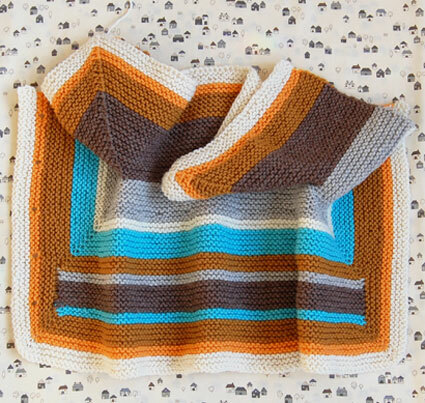 When I started knitting, I had no idea where the pattern had begun, the idea is that you knit something that looks really weird, fold it, and - big surprise! - you have a jacket! It was maybe not the best idea to make stripes since I didn't really know if I was starting with the sleeves or back, and I didn't really know how the stripes would match up in the end. But I was lucky and it turned out alright. It was a fast knit, and I can strongly recommend you to try this project! The pattern is found in Elisabeth's book The Opinionated Knitter. The sleeves are not terribly long, but I thought that was a good thing really. It suited my newborn just fine. The Purl Bee adjusted the pattern and made a collar which also looked nice. They also show a picture of the weird-looking knit before it's folded. Who could imagine this thing would turn into a baby jacket? Summary in Swedish: Till dagens symöte: Elisabeth Zimmermanns Baby Surprise Jacket var både rolig och snabb att sticka. 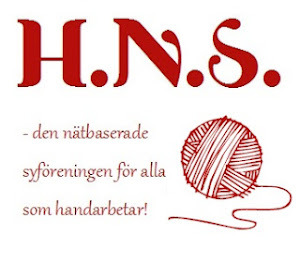 Även om jag inte visste om stickandet började vid ärmarna eller bakstycket... Mönstret finns i hennes bok The opinionated knitter och jag hittade svensk hjälp och översättning här. Man behöver ändå originalmönstret, men det var bra att få hjälp med vissa sticktermer och funderingar kring mönstret. Ibland var det svårt att förstå sig på det... Men lyckan när det oformliga färdigstickade stycket kunde vikas till en kofta var stor! Gillar mönstret och färgerna. Måste vara spännande i slutändan att se om/hur det hela finurligt viks ihop till en kofta. Vad fin den blev och skönt att slippa sy ihop tröjan.